Check out how many calories in Baked Herbed Chicken. Get answers to all your nutrition facts questions at FitClick. 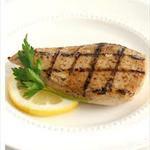 Description: Skinless chicken breast baked in white wine, thyme and rosemary. Tip: For nutritional information on all the ingredients in Baked Herbed Chicken just click on each ingredient name. Then adjust the serving size for any Baked Herbed Chicken ingredient with the serving size tool in the nutrition facts area to the right to see how you can save calories, carbs and more. Clean and trim fat from chicken breast. In a small bowl, whisk chicken broth, wine and herbs together. Place chicken in shallow baking dish and pour wine mixture over. Bake for 15 minutes or until meat is no longer pink. Find more recipes like Baked Herbed Chicken. FitClick has over 60,000 foods and recipes with detailed nutrition information to view. herbed eh? sounds kinda sketchy..